The question is not what you look at but how you look & whether you see. Sometimes surprising things appear magically when you go for a walk with your eyes open. 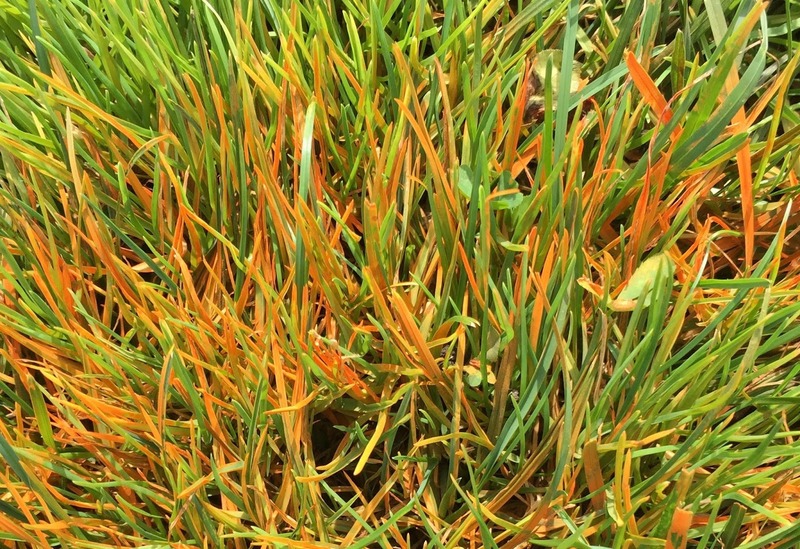 Orange, grass-killing fungus, or something else? Walking across a large playing field in Newton Center, I noticed grass splayed out in a circle about a foot across, and outlined by a bright orange ring. My first impression was that a fungus must be killing the grass plant, causing it to fall over from its central root, with orange fungal spores emerging mid-stem. 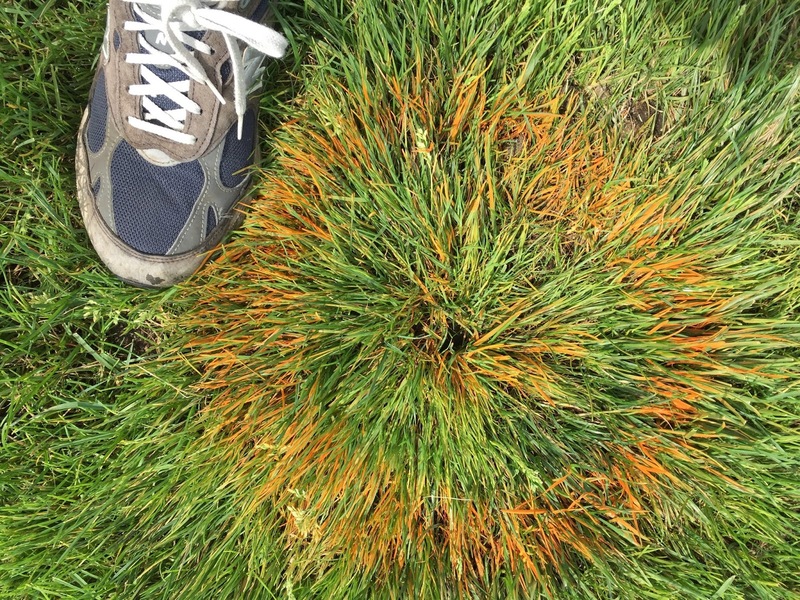 Closer examination showed that many such orange circles occurred in a regular pattern across the field, and the orange seemed more like paint than fungus. In fact, I soon realized, the orange color was spray paint indicating below ground irrigation nozzles. Close-up of the orange circle. Looks like paint! Walking in the Hammond woods, I spied what seemed to be a blazing white gem in the shaded forest. The gem, about a foot across and three feet above the ground, shimmered with brilliant white light, changing by the moment. As I got closer, I could see that it was an unstructured three-dimensional spider’s web, backlit by a stray sunbeam, with the spider visible at the top of the web. Shimmering white gem in a shady forest. See the spider? Two amazing novelties during walks along well-worn paths. 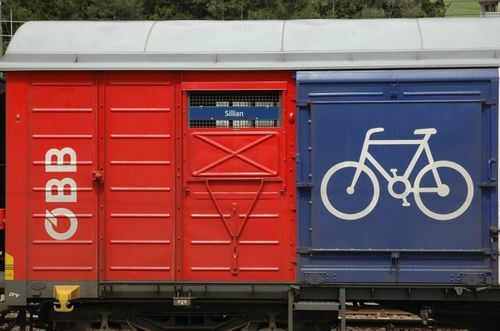 When considering whether to bike to work or for pleasure, some concerns may make you hesitate. Is it safe to bike? Will there be enough space on the road, and will cars know to watch for me? Is there somewhere to leave my bike when I arrive? The bike-friendly regions of the Dolomites and South Tyrol in Italy have your answer: yes! 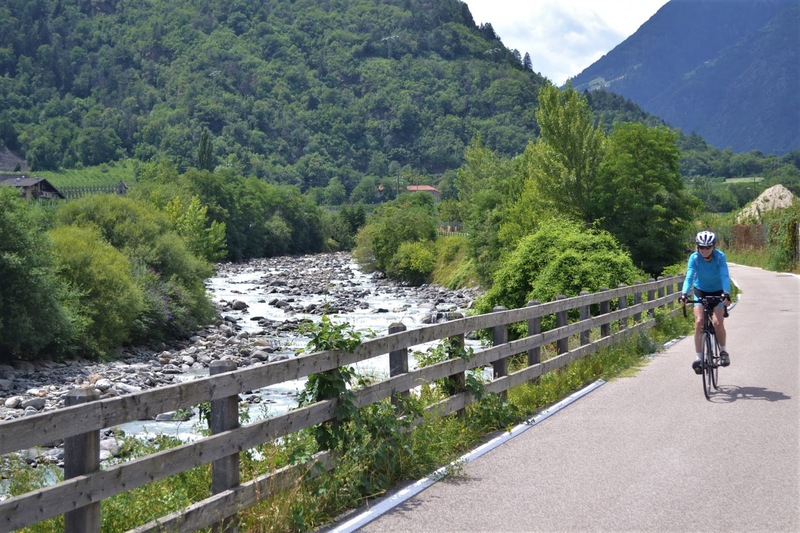 These regions, located in northeastern Italy, have developed a culture and infrastructure to cater to cyclists. An expansive network of bike paths connects many of the towns and cities in the area. You can bike for dozens of kilometers without ever encountering a car. The paths are well-marked, with frequent signs guiding cyclists to their destination. As a plus, many of the paths roll along with beautiful rivers and streams. The Italian cities offer bike racks in every shape and form. Your wheels can rest in slabs of marble, notches in tree trunks, or even slip into slots in the cobblestones. The infrastructure, bike shops, and fellow cyclists all contribute to a culture that encourages people to get out and see the country on two wheels. On Tuesday, August 7, Amanda Gallinat accompanied me to Merryspring Nature Center in Camden, Maine, where I gave an outdoor lecture in a beautiful hexagonal gazebo. Back in April, Merryspring invited me to give a talk in their summer lecture series — they were interested in hearing about my postdoc research on alpine habitats in Maine. I brought along a giant pad of paper for an informal chalk talk that covered the methods and motivations behind my paleoecological field work in Acadia National Park and Baxter State Park. The talk covered my postdoc research: I spoke about the paleoecological history of tundra habitat in Maine and our recent fieldwork to collect new pollen cores from Acadia National Park and Baxter State Park. I also introduced my long-term goal of bringing together all the federal and state agencies and NGOs that work above treeline in Maine for cooperative conservation planning workshops. The weather was a stark contrast to my stories of coring through the ice on Chimney Pond last winter, but the breeze through the gazebo kept us (relatively) cool in the August heatwave. The small crowd of retirees and nature center enthusiasts had great questions & kindly complimented my sketches of alpine plants, mountains in Maine, and coring equipment. Thanks to Merryspring Nature Center for the invitation and thank you to Amanda for the photos and great company on the drive up Route 1! Thoreau in his correspondence, 1850. 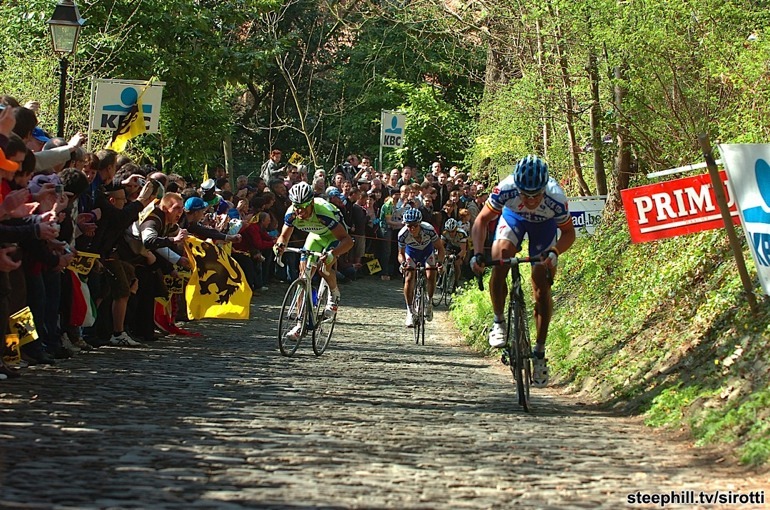 In a recent article, Belgian researchers examined television video archives from 1981 to 2016 of the Tour of Flanders, a bicycle race held each year in the beginning of April, to determine how climate change affects the leafing out and flowering phenology of 46 individual trees along the race route. Trees are leafing out and flowering earlier now than in the past, and earlier phenology is linked to warmer temperatures in the three months (January, February, and March) before the race. Spring phenology is not affected by temperatures in October through December, the amount of precipitation in months before the race, or tree characteristics. Trees are flowering earlier over time in response to a warming climate, as indicated by later phenology stages. (Figure 2b from DeFrenne et al. 2018).